PvP Season 7 Top 3. PvP Season 7 Top 100. Zancudo, Lesterio, Jesper and 2 others like this. PvP Season 8 Top 3. PvP Season 8 Top 100. Zancudo, Primer, BlackAdder666 and 3 others like this. PvP Season 9 Top 3. PvP Season 9 Top 100. Narlyen, Zancudo, BlackAdder666 and 1 other person like this. Overlord foofoo, Lesterio, Victorash and 5 others like this. PvP Season 11 Top 3. Just in case some warlords with lots of time on his/her hands wanted to count how many WLI members are in there!!! Lesterio, Overlord foofoo, Zancudo and 1 other person like this. 33 out of the 50 members of WLI mannaged to get in there. Lesterio, Overlord foofoo, BlackAdder666 and 2 others like this. I went through this thread in order to compile a list of all the ONEs throughout the history of WoA. Unfortunately I'm missing 3 winners: #44 (2nd half of January 2018), #45 (1st half of February 2018), and #47 (1st half of March 2018, also the first PvP tournament in the new season). Does someone has this information somewhere? Overlord foofoo and BlackAdder666 like this. I thought Jin won the first season. Edit: on second thought, I think it was a player with Asian characters. We were discussing the translation of his name in the Wannabes thread around page 11-12. Yes. First season there were a bunch who had 22 saved battles from old format. Jin has fought all his so didn’t make leaderboard until second season. I do remember the same person won first and second season under new format. From the depth of my fuzzy brain comes the first new PvP season top 3. Not a WLI members in sight. I didn't win the first 2 seasons but ironically I've a higher spawn rate than the ONE. PvP Season 12 Top 3. PvP Season 12 Top 100. Did WLI dominate top 10??!! Jesper, Lesterio and Overlord foofoo like this. PvP Season 13 Top 3. PvP Season 13 Top 100. Is WLI Theme Song 'We Did It Again!!'? Guru, Lesterio, Mark Engle and 1 other person like this. //sorry @Jin to take this from you this Season, but I have to brag about it and also time was running out and I didn’t want to miss the 1 day window to make the clip. Guru, Lesterio, Jesper and 3 others like this. @Victorash.Thank you very much for continuing the update on Season Top 100 and Top 3.
aka The Spawn-pocalypse aka Season of the Superspawn aka Season of the Glitch. This season had an aberration where some players received as many as 20 extra spawns due to a glitch. Additionally, there were several spawn sessions where all new spawns were clones of your own army. Innogames awarded 2000 War Coins to all players as an apology for the various glitches. This was also the first season where high level players had 5v6, 5v7, and 5v8 spawns. 1s and 2s spawns were eliminated for high level players. Lesterio, Jin, SirSmith and 2 others like this. Congrats to Lesterio, who cruised to an easy victory. This was the second season with 5v6 and 5v7 spawns. 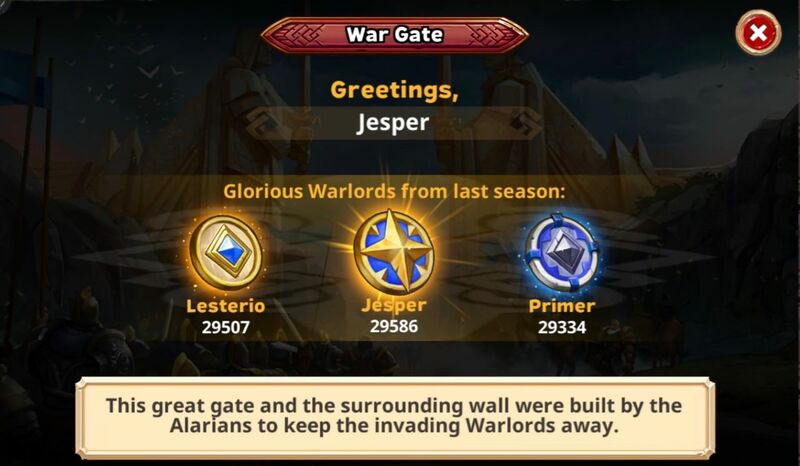 Not many diamonds were spent by the top warlords, as many were leery of another glitchy season. Thankfully, the season was relatively glitch-free, with the exception of a few sessions which spawned clone armies. Spiderman, Zancudo, Jesper and 2 others like this. Hurdles for competing Warlords included a change in spawn mechanism about 3 days in, courtesy of our intrepid dev team. Needless to say, competitive players were up in arms over this unannounced change. This was followed shortly after by the download bug that had many players unable to enter the game for nearly a day. After that, the Blue Tiles of Misery bug affected our iOs players for a few spawn sessions. Props to Alex, who had a phenomenal run with an army under 30k AP. That's some studly fighting! Spiderman, Jesper, Zancudo and 5 others like this.